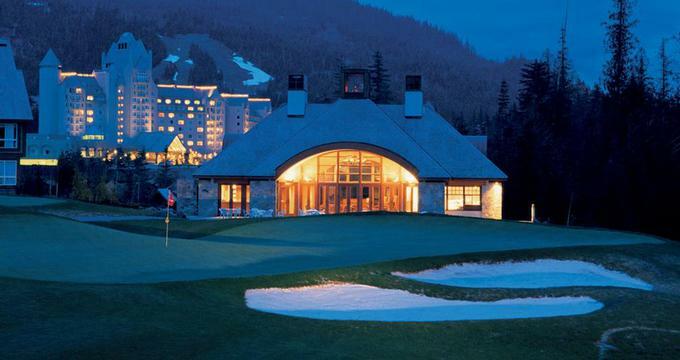 The Fairmont Chateau Whistler is a great winter getaway located at the base of Blackcomb Mountain in British Columbia. Stay at this unique resort to enjoy great skiing on Blackcomb Mountain in the winter, the resort spa, golf in the summer, and many other outdoor activities. Whistler/Blackcomb, two side-by-side mountains, offer more than 7,000 acres of skiable terrain and a vertical rise of 5,200 feet. The Ski & Snowboard School is one of the largest in Canada and offers a number of adult and kids programs. The Golf Club features a par 72, 18-hole golf course carved out of the mountain slopes, with elevation changes of more than 400 feet. Terrain winds through creeks, ponds and granite rock faces. Other golf courses are also available nearby. Visit The Spa and choose from signature Ayurvedic treatments, balancing treatments for the body, mind, and spirit. Pindha Sweda, for example, begins with a hot oil massage and ends with a body wrap. Other specialty treatments include Thai massage, hot stone therapy, Shiatsu, water therapy, facials and various esthetic body treatments. There are 550 guest rooms and suites with mountain or village views. Ski slopes are located right outside the doors of the hotel. There are many restaurants to choose from at the hotel and in the nearby village. The Wildflower offers a large selection of wines and a contemporary French menu. For intimate dinners or small gatherings, guests can hire the Private Wine Room. Portobello is a casual family restaurant with historical West Coast decor. If offers a selection of soups, salads, seafood, sandwiches and vegetarian options. The Mallard Lounge and Terrace offers views of Whistler Mountain and a selective scotch and martini list. Located at the base of Blackcomb Mountain, the property offers great skiing in the winter and a selection of other vacation activities year-round. The hotel is a 10-minute walk from Whistler Village which offers shopping, galleries, bistros, restaurants, bars and nightclubs. Winter is a great time to go for skiing, summer for golf, fishing, hiking or mountain biking. The property is about 2.5 hours from Vancouver International Airport. At the airport, guests can rent a car or take a bus or a train to the resort. For more information, visit the resort web site. Take an adventure trip to Whistler, Canada to enjoy its scenic mountain beauty, luxurious spa and golf facilities. Stay at this beautiful resort which offers many activities for kids and grown-ups alike. Get your 3rd night free in a Fairmont room when you stay a minimum of three nights. Rates for this special start at $239 CAD per night (from just $159 per room per night once you take into account the discount). The golf special includes: 2 nights' accommodation, 2 rounds of 18-holes and Shared use of electric golf cart with fully integrated GPS system. Rates start at $299 CAD per person. Exclusive Fairmont Guest golf privileges include: Unlimited golf, Unlimited, free access to the Practice Facility and Children golf for free. Complimentary, unlimited rounds of play are extended to all Fairmont guests on the same day of play following their initial paid round. Complimentary rounds can be reserved upon completion of each round. The Whistler Family Offer gives you the second room of equal or lesser value at 50% off.